Clara Parkes’ Review of 2011 provides a great overview of all the growth and excitement we’ve seen in the knitting world in the past year. Thanks Clara! 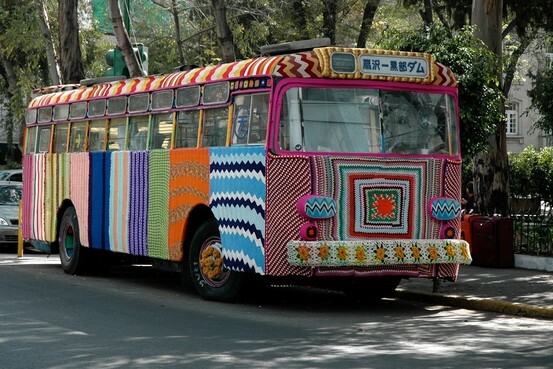 For both good and bad, yarnbombing is not just a guerilla activity any more. The profile of Madga Sayeg in the Wall Street Journal highlights the other side of yarnbombing... as an organized, planned and paid activity. Ms. Sayeg started her yarnbombing career for fun, with a simple door-handle cosy, and is now a paid artist working with a team taking commissions from municipal groups and corporations, charging between $25,000 to $70,000 per project. Ms. Sayeg should be credited as one of the artists helping establishing yarnbombing as a legitimate form of installation art. At the Everett Children's Museum, adorning a statue. A little less ambitious but just as wonderful, Renee Walsted is a one-woman yarnbombing squad bringing a little festive cheer to the city of Everett, Washington. Ms. Weaver, wearing one of her own designs. A fab profile of Knitty designer Ann Weaver from the Grand Rapids Press, in Ann’s hometown. I love reading about the disparate influences and educational backgrounds of designers. A fascinating New York Times obituary for Erica Wilson, store owner, teacher, designer and needleworker. Although not primarily a knitter, Ms. Wilson is responsible for the promotion of a variety of needlearts in the US through her chain of stores, her books and her TV shows. Considered to be “the Julia Child of needlework”, her influence was broad-reaching, with television appearances in the UK and Australia. Ms. Wilson is credited with being largely responsible for the midcentury American renaissance of hand embroidery, a traditional art that had waned in the 20th century amid the rise of machine sewing. She even had a syndicated newspaper column in the 1980s, “Needleplay”. Looking forward to 2012, Pantone has announced its color of the year: Tangerine Tango. Thanks for the info about Erica Wilson. I have a couple of her lovely embroidery books; I used to do a lot of embroidery — in the time I now spend knitting. I met Ann Weaver (and the author of the article, Jennifer Ackerman-Haywood, who has her own magazine Craft Sanity) when she was in Grand Rapids at a book signing. Both were very nice – and it was thanks to the article you linked to that we knew she was going to be at a store only a few miles away.